In Windows 8, Windows 8.1 or Windows 10 there is a particular bug that will give you the message that you need to enter your most recent password. We have found a fix to this issue. By following the lines below you will find out exactly what to do to solve your ‘Click here to enter your most recent password‘ message in Windows 8.1 or Windows 10. 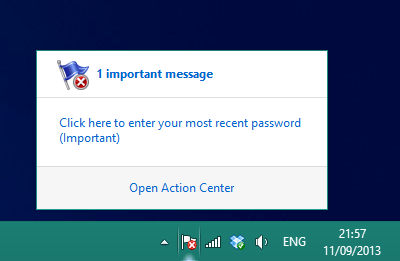 Under the Action Center feature in your Windows 8.1 or Windows 10, you will also have a red X giving you the message “Click here to enter your most recent password (Important)”. Although you can enter your password there and temporarily fix this issue, after a reboot of the Operating System you will be prompting you again with this message. 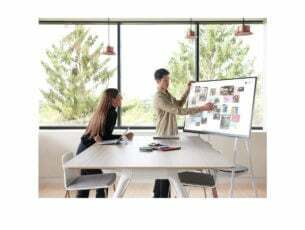 From the Start window in your Windows 8.1 or Windows 10, you will need to start writing the following: “Control Panel” without the quotes. It should automatically find the Control Panel feature. Left click or tap on the “Control Panel” icon after the search is finished. In the Control Panel window Left, click or tap on the “User Accounts and Family Safety” feature. 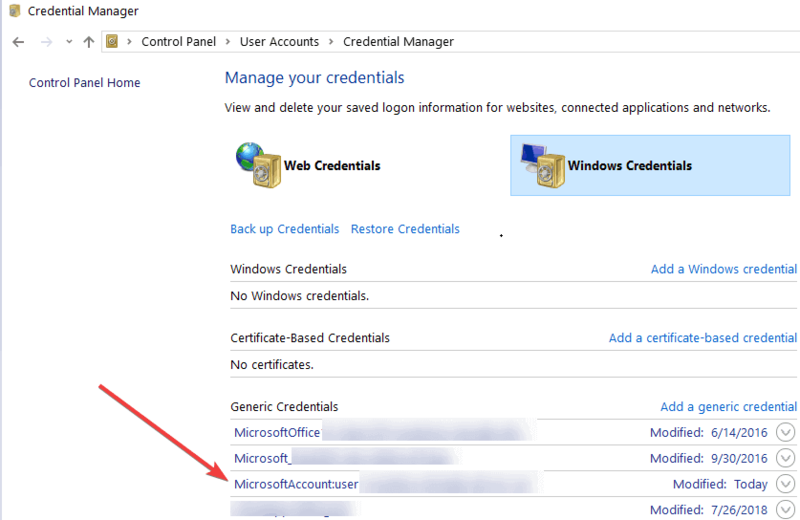 In the “User Accounts and Family Safety”, left click or tap on the “Credential Manager” feature to open it. Left click or tap on the “Windows Credentials” feature to open it. Look for the “Generic Credentials” topic in this window. Note: Instead of “your username” in the line above, it should the user you are using. Left click or tap on the “Edit” button in this topic. From the “Edit” window you should be able to change the password you are using. After you changed the password, left click or tap on the “Save” button. Close all the windows you opened so far. Reboot your Windows 8.1 or Windows 10 device. After the device starts up check again to see if you still get the message “Click here to enter your most recent password (Important)”. If only the notification itself is still giving you headaches, you will find out how to disable it in the step below. From the Start screen in Windows 8.1, move the mouse cursor over to the upper right side of the screen. 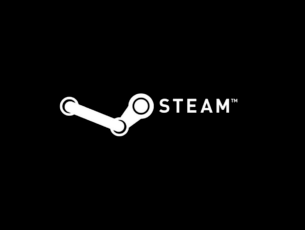 Left click or tap on the “Change PC settings” feature. Left click or tap on the “Search and Apps” feature. Left click or tap on the “Notifications” feature. Now, in the menu that shows up, you can disable the notification for this particular issue. 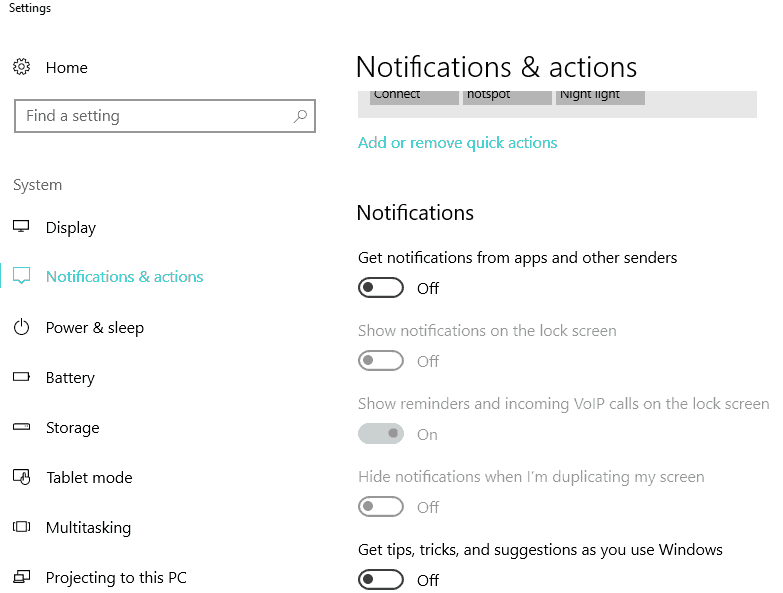 To change notification settings in Windows 10, go to Settings > System > Notifications & actions and disable the respective notifications. 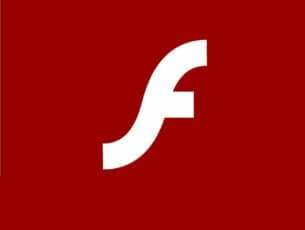 If you are using the CCleaner application with your Windows 8.1 or Windows 10 device, then you will have to follow the instructions below because this application can also interfere with the system thus giving you the “Click here to enter your most recent password (Important)” message. Go to the “Windows Explorer” section on CCleaner. Now, from here, you will need to turn off the option of cleaning of the “Network Password”. Save the changes you made and close the CCleaner application. Check again to see if you still get this message after the device starts up. Some Windows 10 users confirmed they managed to fix this issue by switching to a local account. Then switch back to your Microsoft account and that should be it. The steps listed above should help you solve your “Click here to enter your most recent password (Important)” message in Windows 8.1 and Windows 10. If you do have further questions on this particular topic, please write us in the comments section below and we will help you further with this issue. Editor’s Note: This post was originally published in February 2015 and has been since updated for freshness, and accuracy.